Well, actually, I ended up not rocking it very much, but the deck had a good run all the way to the very end. 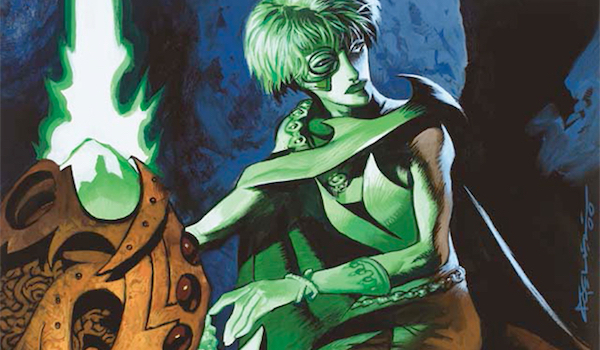 Without further ado, here’s my tournament report from the first edition of the Premodern Online Open, featuring The Rock. This take on the archetype differs in important ways compared to most other The Rock variants floating around (e.g. no Birds of Paradise), but rather than analyzing this here, let’s go straight to the matches. So this is a matchup that should favour The Rock, my build being tuned as aggro-control, or midrange, if you will. I had no discard during game 1, so I assumed I was facing off versus a regular Sligh list. He had a decent start, and I thought I was about to stabilize when I was caught off guard by Blood Lust. I Duressed turn 1 and saw two Ball Lightning, Furnace of Rath, Incinerate, with my opponent having two lands in play. I went into the tank for some time, and ended up picking the Furnace of Rath, since I would never be able to win the long game if it resolved, should my opponent get to four mana. My opponent ripped two lands off of the top during the consecutive turns, and I deployed walls to block as much incoming Ball Lightning damage as possible. 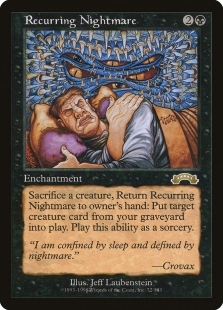 Having bought myself enough time, I eventually started going off with Ravenous Baloth and Recurring Nightmare. This ended up being a non-game, with me deploying walls, into Pernicious Deed, into Ravenous Baloths. This is also a matchup that I consider to be slightly favoured for The Rock, and it is also one of the matchups I’ve had the chance to practice the most. 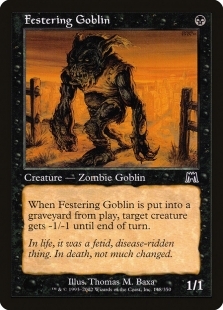 I kept a hand with Festering Goblin, Recurring Nightmare, Deranged Hermit. 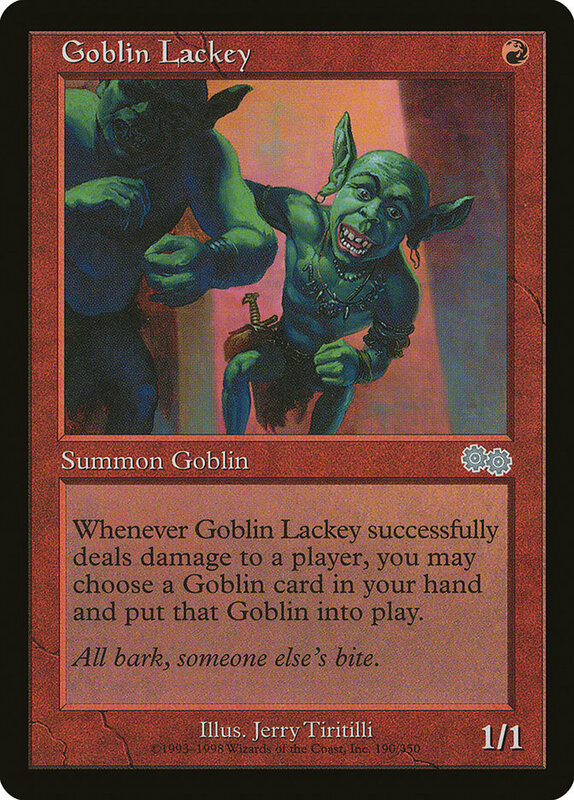 I lost the dice roll, and my opponent led with turn 1 Goblin Lackey, the god start. 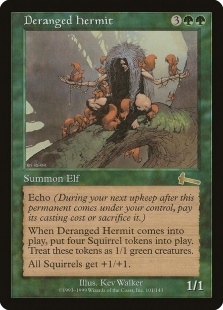 However, my turn 1 Festering Goblin was good enough to keep me alive for the longer game, eventually allowing me to make over 20 squirrels with my favourite dreamy Deranged Hermit. I was extremely happy to see Festering Goblin and Vendetta in my opening hand. My opponent started out with turn 1 Goblin Lackey again, but my beloved black goblin turned out to be stronger. The opponent played a couple of Goblin Kings and a Goblin Warchief, but I was able to trade favourably in combat thanks to a Ravenous Baloth, a few walls, and the Vendetta as a combat trick, shrinking the remaining goblins. I eventually won with the help of Pernicious Deed(s) and a couple of Ravenous Baloths. 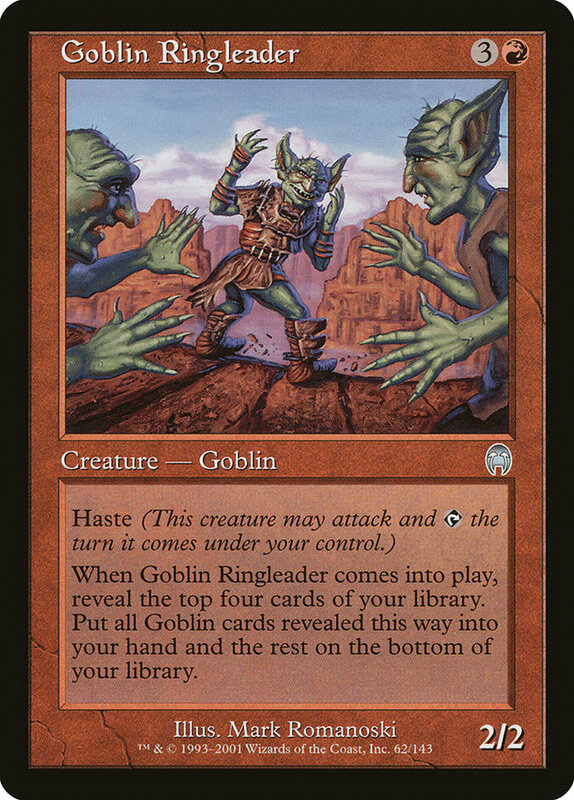 I aggressively traded in combat before the goblin player could find a Goblin Ringleader to rebuild. I have never seen a list like this before, so I didn’t know what to expect. 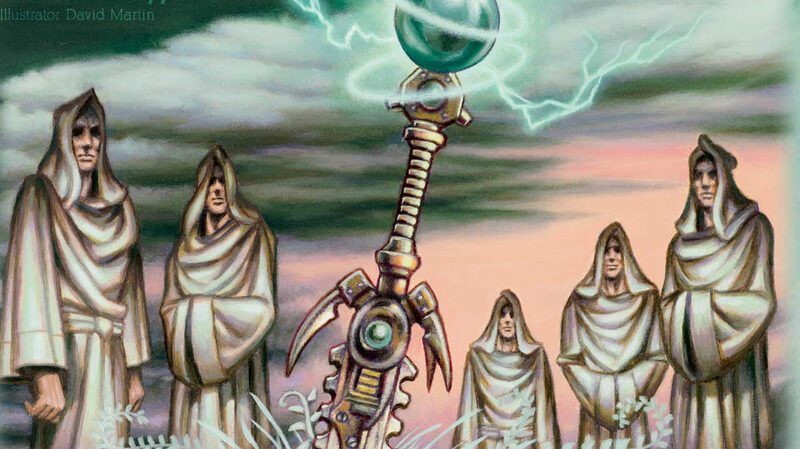 Swords to Plowshares was the key card in this game. A Serra Angel into Armageddon resulted in a fairly quick game. I cannot remember the sideboarding, but I believe I would have brought in Chainer’s Edict and 3 Duress, taking out high CMC cards. The game started out with me having a few Wall of Roots, which greatly helped versus the mana denial/Armageddon plan. Beatdown with a few big beasts won this game in quick order. A long game of cripples, Pernicious Deeds from my side killed early mana dorks from my opponent. He ended up casting more than a few Armageddons and Swords to Plowshares. Having a single Wall of Roots on the board eventually led to me having the upside after a Armageddon, and a single Ravenous Baloth went unchallenged for a few rounds. I kept a hand with two Cabal Therapy, two Vendetta and two lands. 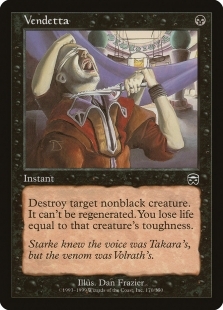 My opponent turned out to be on Suicide Black, and I got a taste of the downside of Vendetta for the first time. I died in two or three turns. Out: dead cards and anything that’s slow. 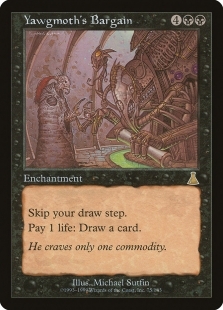 In: 1 Chainer’s Edict and 3 Duress. I mulliganed to six, keeping a hand with Pernicious Deed. I got Unmasked on turn 2, and Lake of the Dead into turn 3 Hatred for 18 on Dauthi Horror was game. 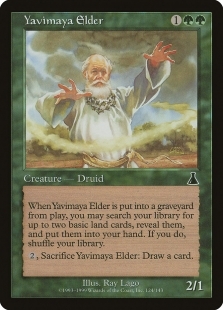 I kept a pretty normal hand with Yavimaya Elder, Ravenous Baloth, Deranged Hermit, but only two lands. 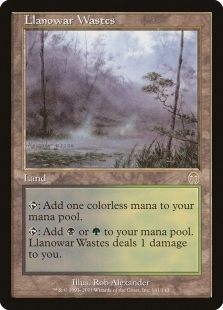 My opponent started out with two basic Islands and doing nothing, which made me put him on Trix or UW Standstill. Turn 3 he resolved Attunement, I didn’t draw my fourth land and couldn’t deploy the Ravenous Baloth (which would have saved me), and promptly died to Replenish returning Pandemonium and Saproling Burst for 21 damage on turn 4. 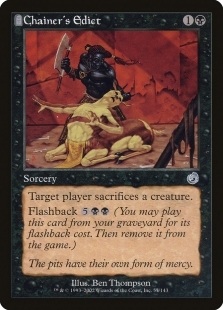 I kept an opening hand with Tormod’s Crypt, walls, Ravenous Baloth, Cabal Therapy, and three green lands. I held the Tormod’s Crypt in hand for as long as I calculated possible to not expose it to artifact removal. I eventually cast it together with a Ravenous Baloth, when I read the opponent as being a turn away from going off. I was stuck on green mana only, and did not know what my opponent was up to. 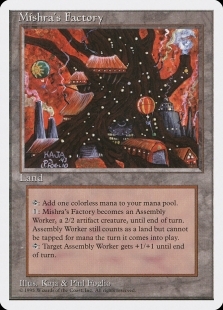 I eventually had two Ravenous Baloths, two Treetop Village, and a Spike Feeder. I felt pretty good with my opponent at 7 life, but he started hardcasting Saproling Bursts to stay alive and managed to buy himself several extra turns, and putting the Bursts in the graveyard. I eventually found a Swamp somewhere around turn 8–9 to cast a Duress which stole a key Replenish, and allowing me to see that the opponent also had Counterspell in the deck. This bought me enough time to close out the game. 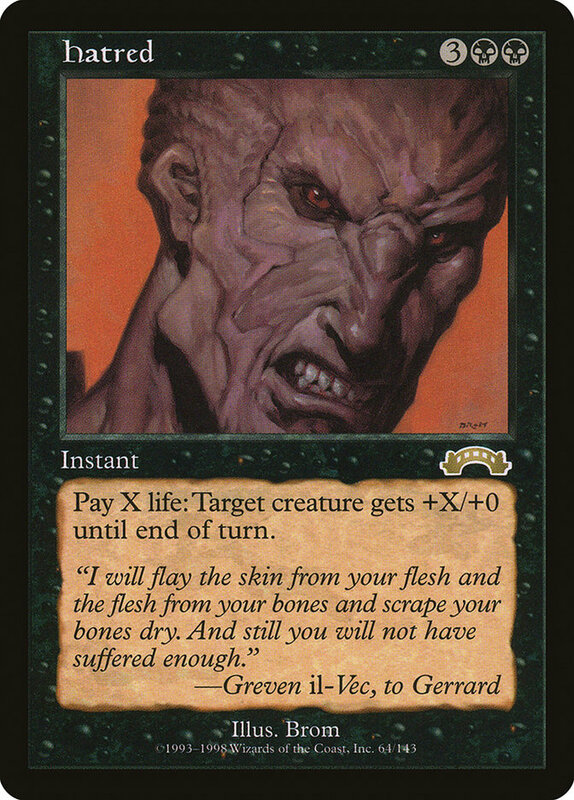 I mulliganed to six cards and kept two Swamp, Tormod’s Crypt, Cabal Therapy, Wall of Blossoms and Festering Goblin. I was not happy, but did not feel that going to five would do me any favours. I scryed a a Wall of Roots to the bottom. My opponent went turn one Island and I went turn 1 Festering Goblin, whereafter my opponent played another Island on turn 2. I swung for 1 and cast Cabal Therapy naming Attunement. I missed, but flashed the spell back to steal a Replenish, leaving my opponent with mostly cantrips and lands. 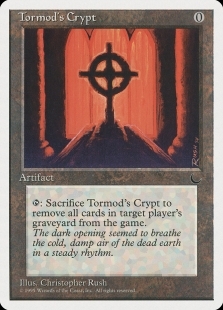 I kept the Tormod’s Crypt in hand, not seeing the need to play it yet. 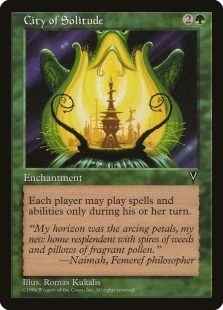 My opponent cast Careful Study discarding Pandemonium and Saproling Burst, and I followed up with playing my Tormod’s Crypt. 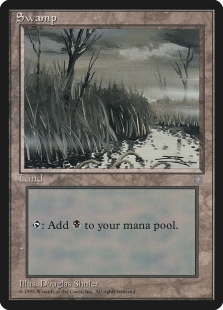 I got stuck on three Swamps for a while, casting a Recurring Nightmare onto a board with no way of using it. 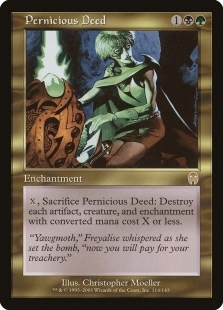 I found a second Tormod’s Crypt which got countered, and a Cabal Therapy that missed (I believe naming Pandemonium because my opponent only had a single red source, and Replenish was a dead card due to the Crypt. 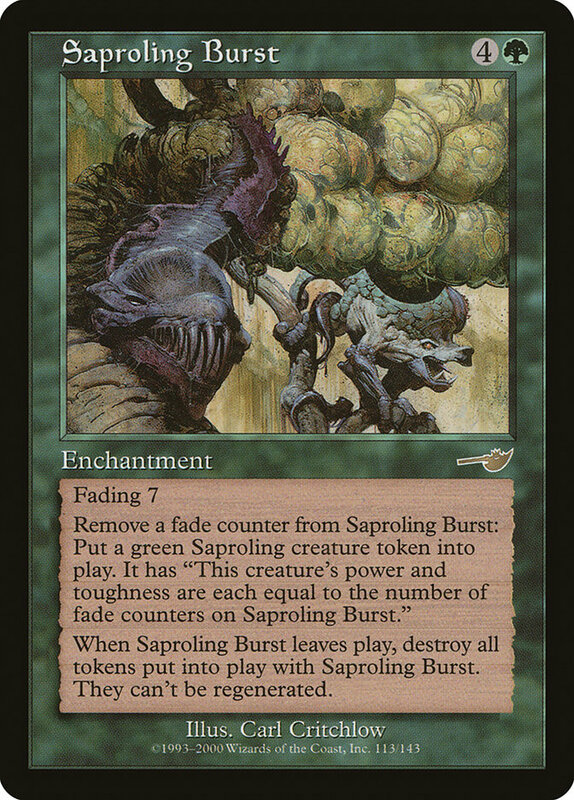 Ripping a red source and hardcasting Pandemonium into Saproling Burst was my opponent’s out). 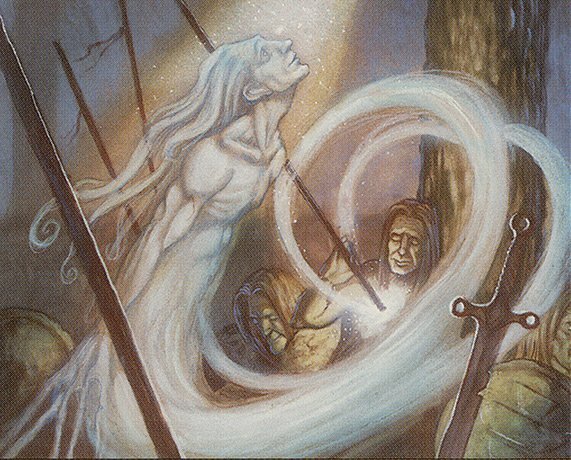 My opponent did nothing but play lands and some cantrips, and he eventually forced me to crack Tormod’s Crypt with a Seal of Cleansing, removing his combo pieces from the graveyard, but allowing him to start setting up again. 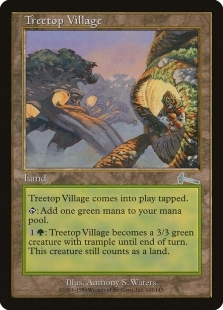 I found a Treetop Village, but could still do nothing with only the single green source. 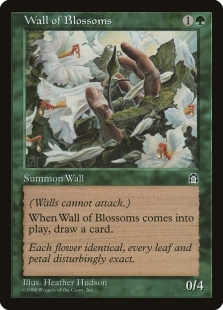 My opponent hardcasted a Pandemonium, and the next turn I deployed Wall of Roots into Wall of Blossoms, sacrificing the blossoms to flash back Cabal Therapy naming Saproling Burst, stealing it out of his hand (phew). At this stage it should be mentioned that I had not yet realized that Pandemonium is a World Enchantment! 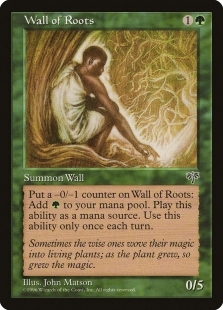 I didn’t have a land in hand, so I sacrificed the Wall of Roots to recur Wall of Blossoms to cantrip, leaving me with access to four mana the next turn (I would have had five, had I not done this). 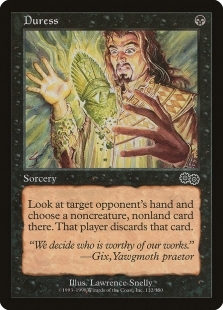 I had two Deranged Hermits in hand, which would have put my opponent on a two-turn clock shooting him for 9 a pop. I realized my mistake, and I get nervous that I have thrown away the game by giving him extra time. 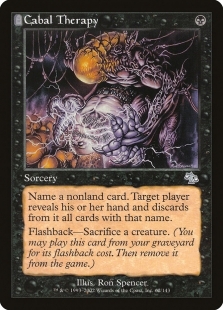 The following turn my opponent Intuitions for Counterspell to prevent my top-decked Tormod’s Crypt from hitting the board. 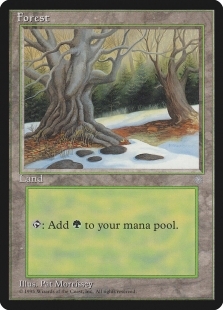 Since I didn’t top deck a land, I cumbersomely spent my turn recurring back the Wall of Roots and passed the turn. I needed that five mana. My opponent plays an Attunement with zero cards left in hand and passes. Okay, maybe we can get there. 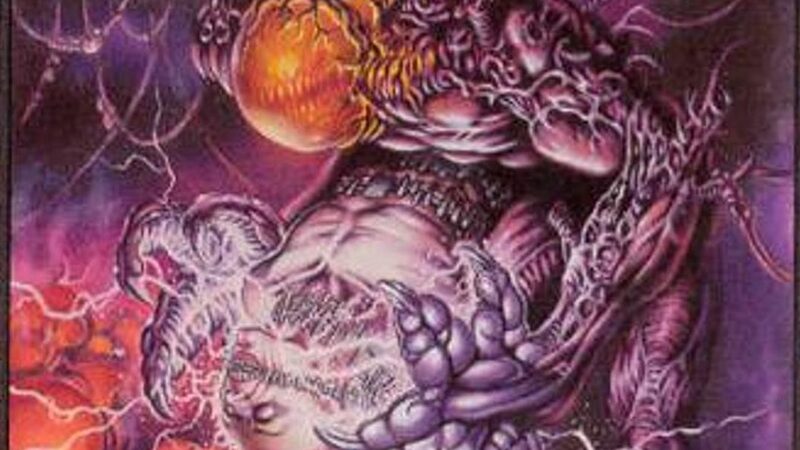 Playing Deranged Hermit to put him on a one-turn clock, giving my opponent the out of Attunement and hitting Replenish + Saproling Burst to kill me, or finding a Counterspell for the second Hermit. 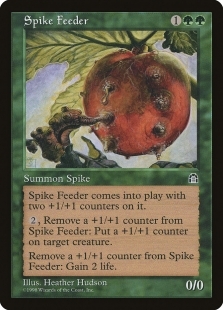 Playing a Spike Feeder, which would force my opponent to go off twice, but also giving him an additional draw step to find either an extra Pandemonium, or two Saproling Burst. My opponent Attunemented into all the combo pieces, but no Replenish. 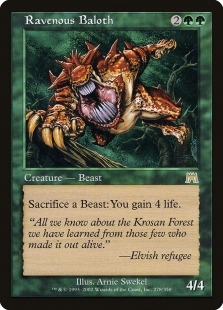 The next card in my opponent’s library was Replenish. With two rounds remaining I felt pretty good about my chances. Winning one of them would lock me for top 8, and a 4-3 record could lead to top 8 on tiebreakers. Having put my opponent on 4C Control due to his land drops and cantripping, I missed on a Cabal Therapy and saw a Mirari’s Wake. I got stuck on two lands and a Treetop Village, and opted to activate it to put a clock on my opponent. It got Swords to Plowshares’d and I did nothing for the rest of the game. 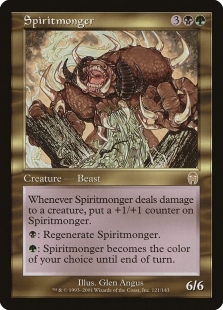 I mulliganed to six, and kept four lands, City of Solitude, and Spiritmonger. Not a great hand, and I would have liked to see some discard, but going to five didn’t feel like a great improvement. 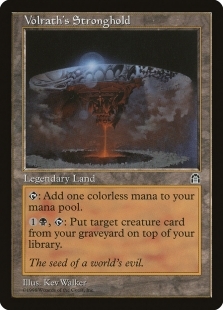 Also, making my land drops would be important in this matchup. I played a pretty normal game for my deck, deploying threats and City of Solitude. 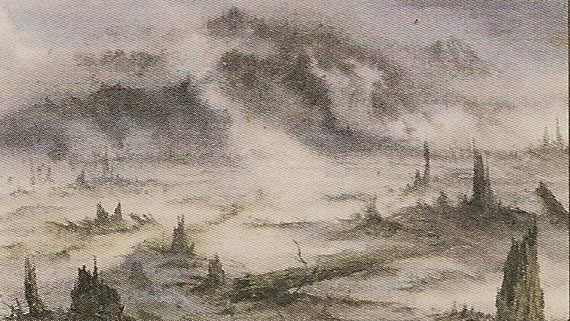 My opponent played 2 Wrath of God, Cunning Wish for Ray of Revelation to destroy the City of Solitude (which also stranded a Yawgmoth’s Bargain in my hand). Opponent played Mirari’s Wake and went infinite with Palinchron. I had played versus this opponent and deck before, so at this point I kind of knew the writing was on the wall. Another terrible matchup for a midrange deck. I do not have any notes for this matchup, but it pretty much goes Cloud of Faeries into counterspells into Winter Orb (recently errata’d) into Opposition, and Icy Manipulator (for the complete, one sided lock-out combo). Overall, I was very happy with the deck’s performance at the tournament, and had I not run into two decks specifically tuned to hosing midrange at the end of the tournament, I believe The Rock could easily have top 8’d. 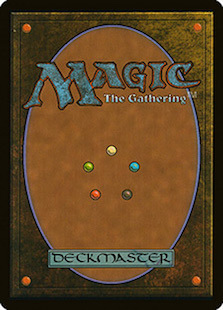 Looking at the lists that made it into the top 8, I also believe it would have been able to stand on its own there. I strongly believe that The Rock is a deck more than capable of winning a tournament, with several favorable matchups versus tier 1 decks. 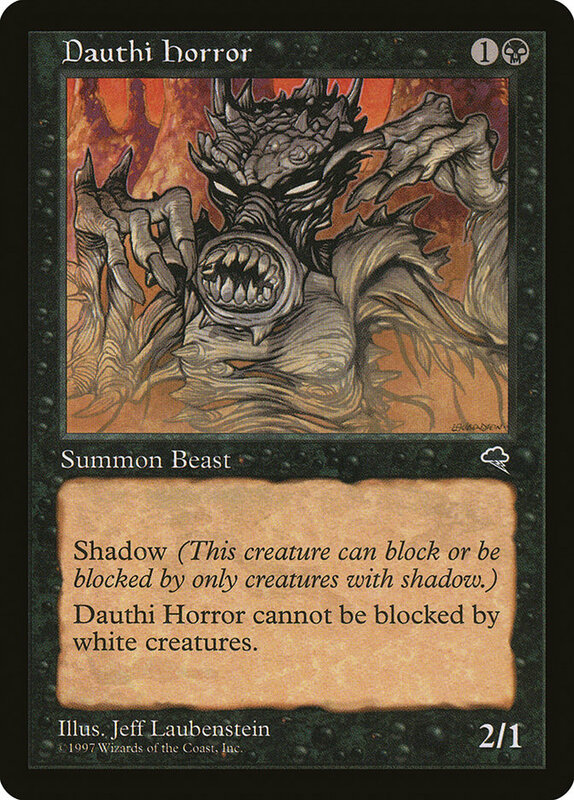 However, it does have its weaknesses, and with bad matchups it can feel like the deck does close to nothing. Would I make any changes to the deck based on these results? Probably not. 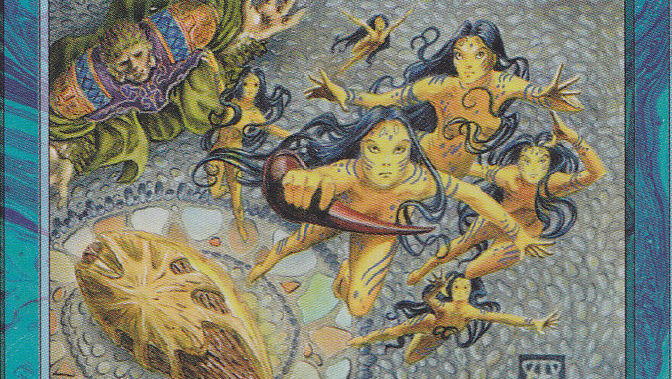 Depending on the expected meta, the three Duresses could be placed in the main deck, replacing a Yavimaya Elder, a Pernicious Deed, and a Deranged Hermit (or Spiritmonger). I did feel like I brought additional discard in a lot. 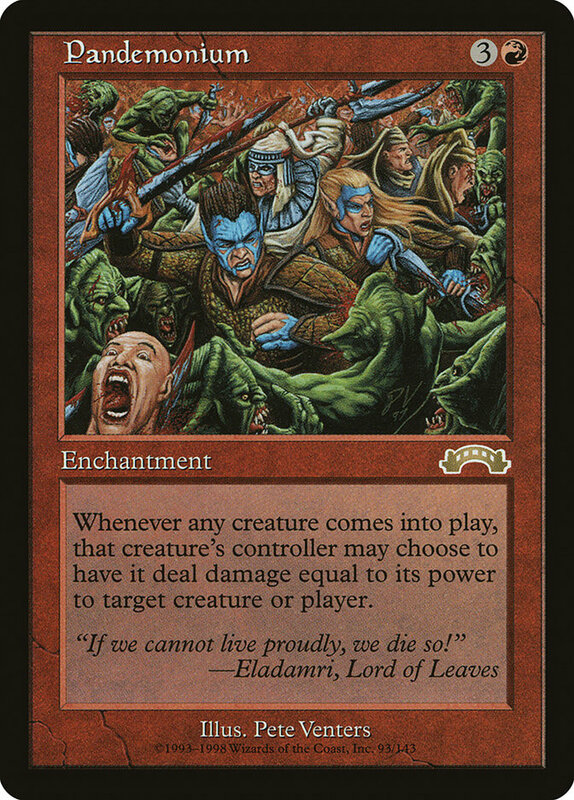 The deck does some very powerful things, but doesn’t quite do it fast enough, and isn’t quite managing to slow down the opponent enough to buy time. I feel it’s close to a tier 1.5 deck, and running the deck in a tournament will be a meta call, more than an obvious choice. 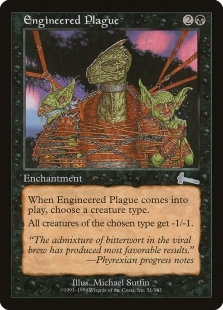 It’s also one of the only decks that, compared to other classic Extended decks, doesn’t benefit from Premodern’s larger card pool. While other decks get stronger additions, The Rock is comparatively weaker than the olden days. 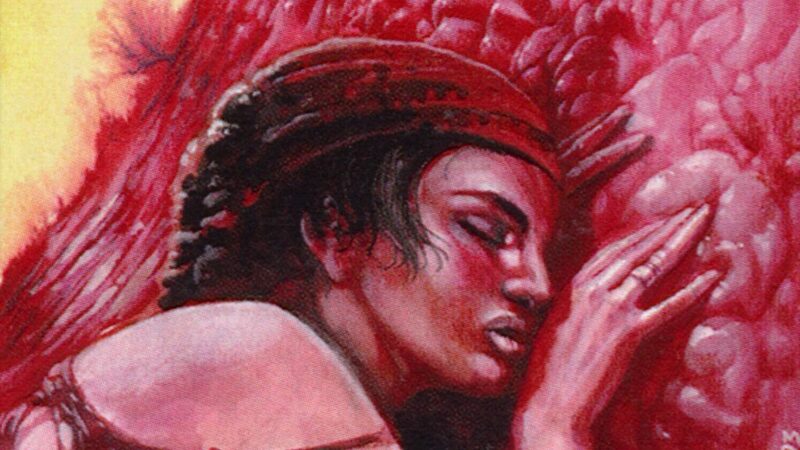 My next project is looking into if there’s a version of BG that could benefit from running Veteran Explorer, due to the synergies with Cabal Therapy and Pernicious Deed. The question is what we want to accelerate into that is powerful enough! As usual, you’re welcome to discuss this article on Facebook, Discord or Reddit. "The River flows. My soul returns."